Our complete line of smooth and textured HDPE Textured Geomembrane Liners combine long-term durability with strength, flexibility, and ultraviolet and chemical resistance, to provide an impermeable barrier for a wide variety of applications. Applications for our products include solid and hazardous waste landfills, landfill closures, secondary containment, ponds, reservoirs, fish hatcheries, irrigation canals, wastewater treatment plants, and industrial waste lagoons etc. 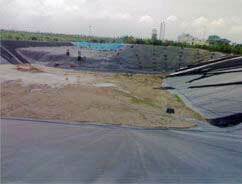 The HDPE Textured Geomembrane Liners are offered in thicknesses of 0.5mm 1.0mm, 1.5mm, 2.0mm and 2.5 mm and rolls are 7meter wide and length depending on the thickness of the geomembrane.